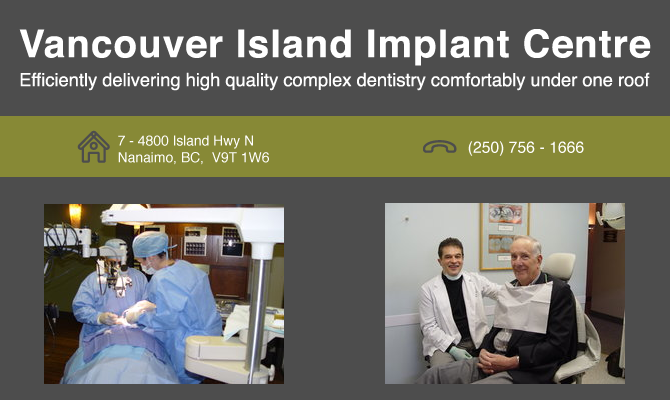 The Vancouver Island Implant Centre is located in Nanaimo, B.C., Canada. We are dedicated to provide predictable and complete Implant Services. We can answer all of your dental implant needs, both in placing the dental implants as well as the teeth on top. We recognize that you want functional teeth and an aesthetic smile. We begin the process by evaluating your needs and desires. Our difference in treatment delivery is evident from when you first come to the office. We take extra time for post operative appointments and care. Some centers do not see their patient until a week after after surgery. We see you the next day and a few times after. This reduces the incidence of post operative complications and pain. Feel free to call us for a consultation and we will explain everything before we do anything. We can also work with your dentist or denturist if you wish. Dr. Wolanski uses a surgical microscope which provides him greater accuracy in implant placement.